No, not a new title for the blog. This post is about a good home tradition to employ. It’s the one time when you can let kids write on the walls. Ingredients: Bible, colored chalk, maybe a stepladder, perhaps some holy water. Proceed to a Bible reading: the story of Zacchaeus (Luke 19:1-9) is usually done with a home blessing, but the Epiphany gospel (Matthew 2:1-12) telling of the visit of the Magi might be more appropriate instead. Reading from a children’s Bible may work if you have little ones. that their concern for others may reflect your love. The letters have two meanings. The names of the Magi were thought to be Caspar, Melchior, and Balthasar. 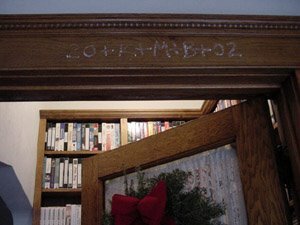 CMB also stands for “Christus mansionem benedicat,” Latin for “May Christ Bless This House.” Option: sprinkle holy water in each room if your home has never been blessed. Sing a Christmas song to conclude. This entry was posted in Liturgy, spirituality. Bookmark the permalink.